Too Fat Lardies have just their 4th ‘Pint Sized’ campaign book for use with their Chain of Command World War II rules. Called ‘Operation Martlet’, this book creates a mini-campaign of up to eleven games with six different scenarios, covering this precursor to operation Epsom. The players take control of either a force of the 49th Infantry Division (The Polar Bears) or the 26th SS Panzergrenadier regiment, supported by the 12 SS Panzer Division. 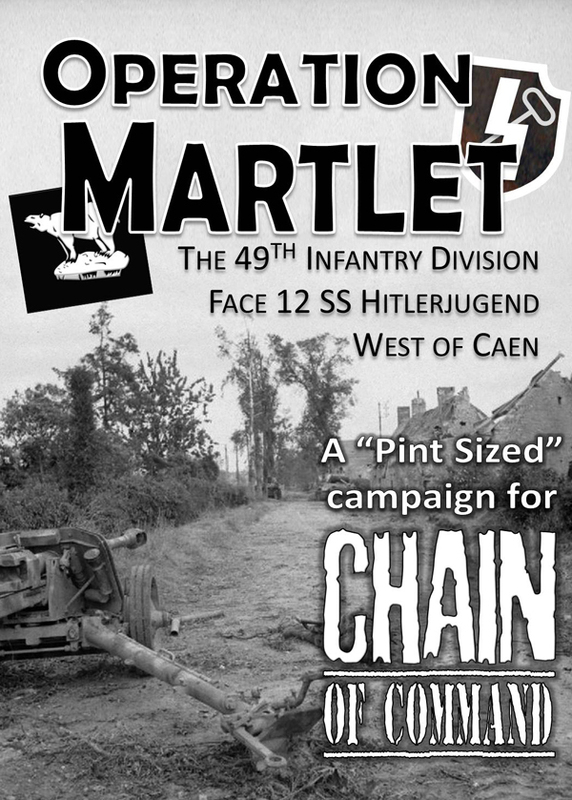 The 28 page PDF document gives an historical overview of the campaign, which lasted from the 25th to the 27th June 1944. The campaign itself follows the push through Fontenay and the subsequent attack on Rauray. Given the protagonists, there is plenty of opportunity to get both infantry and armour involved in the action – this looks to be a great campaign to play. As with other ‘Pint Sized’ campaign books, this volume is very reasonably priced at just £3.60, and will provide you with not only a good read, but hours of gaming fun – and remember, whilst aimed at Chain of Command, this book is usable with any platoon level World War II rules. Grab it from the Too Fat Lardies website now – another ‘must have’ for the World War II gamer.